I’ve asked Tasty’s agent whether the company is planning any changes to the hanging sign over Broad Street. I hope not. That’s the elephant in the room for me. Three cheers for that! The De Grey’s sign has long been part of the Broad Street street scene and changing it or removing it would be intolerable. It’s great news that Tasty Plc. also intends to keep the traditional tearoom and bakery at the front of the premises. The arrival of the Wildwood restaurant in Broad Street was initially seen as a threat to its historic character. Now it looks looks like being a great asset to the street and the town centre. 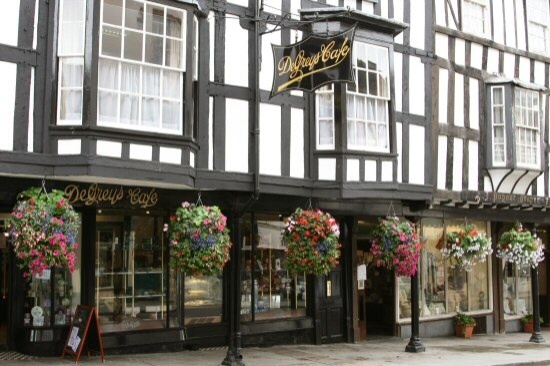 Next Post Ludlow’s Coder Road: a centre of excellence for a town that thinks green?